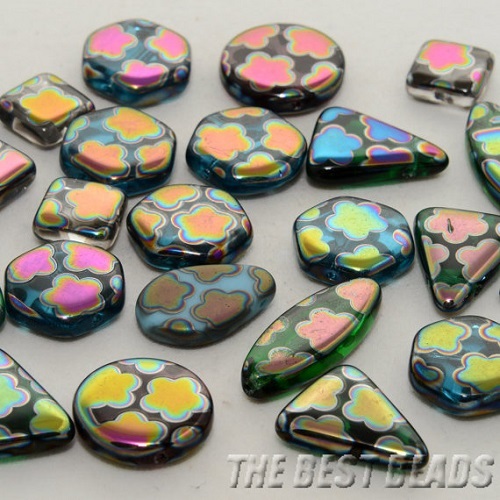 The Best Beads Shop is back with another fabulous Czech beads giveaway! 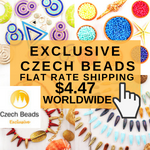 They are based in Prague in the Czech Republic and specialize in traditional and genuine Czech beads. 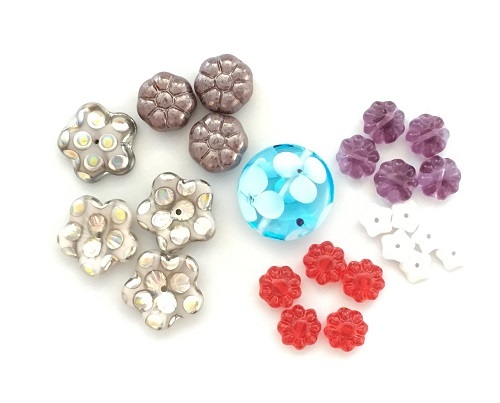 Czech beads are fabulous for jewelry making because they come in a huge variety of sizes, colors and shapes. 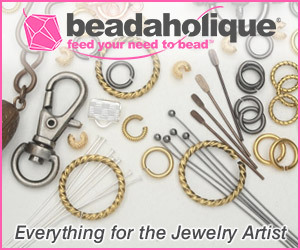 Whether you are into bead weaving, stringing, wire work etc, there are bound to be beads just for you! The Best Beads Shop stocks many different kinds including some of these wonderful flower bead examples. Ekaterina Pushkareva, who owns the business, sent me these lovely examples below. 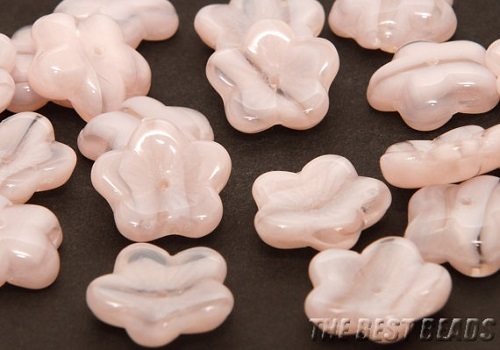 The challenge is to make something from some these flower beads! I enjoy gardening and love seeing flowers growing so it was no hardship! I've done different "flowers in a vase" designs before. But this time, I decided to modify the tree of life idea. The easy wire work tutorial for the basic round frame flowers in a vase pendant is here. The pendants do not have to be round either. The design below came about when I took advantage of the way the wire lengths were curving. 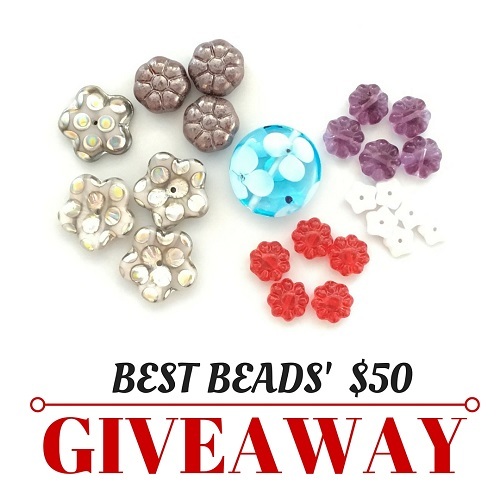 If you'd like to win $50 worth of any Czech beads from The Best Beads Shop, please make a comment below. Make sure you leave contact info below if you do not have an online shop or blog. It ends in a week's time at 6 pm EST Monday, December 7, 2015 . I will pick the winner randomly and announce the results as soon as possible after. So be sure to leave a contact email if you don't have an online link or make sure you come back and check! Otherwise I will redraw in a week. Good luck! I used my new iPhone 6S, the camera+ app and the Modahaus Tabletop Studio TS400 in natural light. Most of the photo editing was done in app. 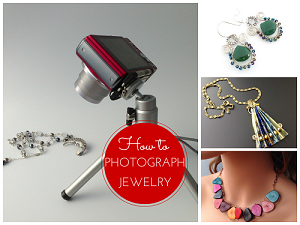 Check here for more information on my How to Photograph Jewelry webinar. Since this is a busy time for many of us, the webinars will resume in January. Would love these pretty beads. Ooooh ! I really love what you have made with these flower beads ! so creative !!! I am not sure if I win I can make something as nice , but I am trying my luck for a try ! I subscribe and follow you on FB. I will post this on my FB page too! I have never seen such beautiful Czech beads! Thanks for the opportunity to win! I love beading. I do all kinds of beading. It is a great hobby for relaxation. I love those Czech accent beads! There is so much variety now it is hard to keep up. Love to win the beads. I am your blog subscriber. Can one ever have too many beads? 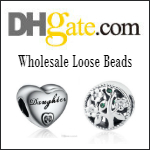 The Best Beads Shop has has so many to choose from and the prices seem quite reasonable. I would love the challenge of picking $50 worth. Thank you, Pearl. Wow! The flower vase idea isso beautiful! I'm going to try it out. Thanks for all your creative ideas and posts, Pearl! Now these are some flowers I can't kill! I would love to plant a garden of these forever beauties. Czech beads are my favorite beads and I appreciate that so many are still made as a cottage industry. Pearl, I love the elongated flower vase- such a good idea and so pretty. I sincerely read your post first thing every day and I always learn something. It's amazing how informative and varied your topics are. And I'm NOT just sucking up because I want the flower beads. It comes from beady little heart. Thank you. Love that comment about these unkillable flowers! I thank you for all the kind words and no, I don't think you are sucking up either! Love the flower vase idea!!! Pearl, as always, you've done a wonderful job using the flower beads to create unique jewelry. I've cheked out their online shop & have already found lots of goodies I want to have. 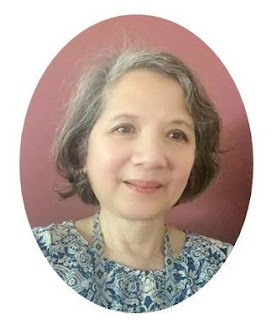 I love reading your blog & following you on Facebook. Those black beads with the flowers are so perfectly retro!! I can easily imagine something funky with those! And those pink cupped flowers....OMG!! Let me at 'em!! Definitely chuck my name in there Pearl.....I could go crazy making something up with any of these!! They really are the Best Beads!! The vase pendant with flowers is genius! I am a blog subscriber, FB follower and I pinned your giveaway. Thank you for another wonderful giveaway. Those flower beads are so pretty! Your flowers are lovely!!! Thanks for sharing and the giveaway. what cute ways to use them!! These flower beads are too darn cute and since I've recently started doing jewelry again as a form of therapy for depression these would be great! Thanks for having these giveaways!!!! for the chance. Love the blog! Leaf and flower beads are my favorites - hope I'm the lucky winner. Thank you for doing this. Wow! These are scrumptious! I pinned that flower vase pendant and am waiting to win so I can make it! Thanks for this great giveaway. I love Best Beads. Merry Christmas, I follow on bloglovin, shared on Facebook, g+, twitter, email and pinned. 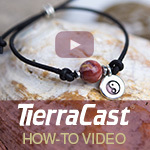 Wow, I love these giveaways and your jewelry ideas. They always spark my thoughts of things to do. The shop is fantastic and if I win it will be hard to keep it to $50, well maybe I shouldn't. LOL Sure hope to win this one! These are so cute. Would love to win. What a fun collection of beads!! Thank you! Love the flower Czech beads and can't wait for the flowers in a vase tut! I'm a blog follower; would love to win. I love the flower vase pendants that you made! What a great idea. I hope I win these lovely beads. cool beads. Love the vase with flowers in it! Wow Pearl! I love these pendants, I've made a couple Tree of Life pendants, and it would have never ocured to me to do something like this. I'm so glad that I read your blog! I follow via Bloglovin and email. Thanks for the chance to win! What a clever use for those lovely flower beads. I'd love to have them! Lovely beads! I'm a blog follower and follow on facebook. I'm interested in the giveaway and am a follower of this blog. I love using Czech glass beads in my jewelry designs....would like to win this one. Thanks for the chance to win. I love the concept of flowers in a vase! Love the czech beads to use in my jewelry making. Great beads! I would love to work with them. I'll keep my fingers crossed. Those pendants are very nice. I would love to win these ! Oh, and forgot to say I'm a blog subscriber and FB follower! Czech beads are a dream, the bead stores in my country do not carry even a small part of the existing varieties! Of course, I'd love to win :) The "vase of life" idea is so cool, Pearl! The tall vase pendant is my favorite! Would love to win these beautiful beads. Would give me a head start for some spring jewelry. Thank you for the opportunity to enter. I lover love love Czech beads! So many shapes and colors! Pretty please count me in for the giveaway! Oh my, Winning Czech beads is like winning a piece of heaven. I'm in. I would love to have these beads in my stash. Winter flowers that won't fade - would be nice to win. I would love to win these beads! These beads are so versatile and come in pretty colors, I would love to try them out. These look lovely - thank you for your nice blog and the chance to enter x. Love your designs, very cute! Thanks for the chance to win! Very cute beads. Looking forward to the flowers in a vase tutorial. I love these pendant designs. They are beautiful. I absolutely love this pattern and the beads are really cute . Thanks for showing us. I am a blog subscriber and these beads are amazing. 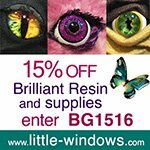 new company to me but gorgeous designs. thanks for the chance to win some. Thanks for the chance to win these lovelies. I am a blog subscriber and would love a chance to win. There are so many great styles of Czech beads, one of my favorites have always been the flowers. Well I commented then stupidly forgot to add my email. Meanwhile my students and I would love to win this collection of beautiful beads. These beads are so beautiful I would love to win them thanks for the chance. Love your pendants and will have to try them out. Winning some of these beads would be a good start.